Time for a ‘Universal Magnitsky Act’? In 2009, Russian tax accountant Sergei Magnitsky died in a Moscow prison after investigating a $230 million tax fraud involving Russian officials. A subsequent investigation into his case by the Kremlin’s own human rights commission, ordered and endorsed (in July 2011) by the-then Russian President, Dmitry Medvedev, found that in order to silence Magnitsky, corrupt officials had accused him of committing the fraud himself and, after a flawed investigation and trial, had sent him to prison. Once there, he had been refused urgent medical treatment and, later, tortured in order to extract a confession. After details of his detention and death emerged, Bill Browder, a prominent American businessman and friend of Magnitsky, publicised the case and lobbied American officials to pass legislation sanctioning those accused of wrongdoing. As part of his campaign, Browder brought the case to the attention of US Senators Benjamin Cardin and John McCain, who proceeded to draft and table new legislation before the US Congress. In June 2012, the United States House Committee on Foreign Affairs reported to the House a bill called the Sergei Magnitsky Rule of Law Accountability Act (2012). The main intention of the law was to punish Russian officials thought to be responsible for the death of Sergei Magnitsky, by prohibiting their entrance into the US and their use of its banking system. The legislation was taken up by a Senate panel the following week. On 6 December 2012, the Senate passed the House version of the law, by 92 votes to 4. The law was signed by President Barack Obama on 14 December. In April 2013, the Obama Administration publicised a list of 18 individuals to be sanctioned under the Act. Later, in response, Russia issued a list of US officials prohibited from entering its territory. Four years after the adoption of the original Act, Congress enacted a new ‘Global Magnitsky Human Rights Accountability Act’ (2016). This built upon and expanded the original 2012 Act (which was focused solely on those alleged to have been involved in the death of Sergei Magnitsky) by authorising the US President to impose sanctions on any individual or entity responsible for committing human rights violations, or acts of significant corruption, anywhere in the world. From an international human rights law and policy perspective, the Global Magnitsky Act is interesting for a number of reasons. First, under international human rights law, the obligations of States Parties relate only to the promotion and protection of the human rights of their own citizens or others living within their own jurisdiction. In other words, the international human rights system, which emerged and evolved in the aftermath of the Second World War, is, in principle, respectful of State sovereignty. While some steps have been taken, over the intervening years, to ‘pierce holes’ in this protective veil of sovereignty (e.g. the adoption of country-specific human rights resolutions, and the creation of country-specific Special Procedures), by-and-large there remains little scope, beyond public criticism and condemnation, for one UN member State to seriously address (i.e. secure some degree of justice/legal accountability for) human rights violations perpetrated by and within another State. Second, and linked to the first point, international human rights law, and the work of the international human rights system – led by the UN Human Rights Council – is extremely State-centric. In this, it perfectly reflects the neo-realist nature of the overall international system (i.e. it is based on the sovereign interactions of nation States). By extension, it is States – not individual representatives of those States – that ratify and become Party to the international human rights treaties. Thus, when States in the UN Human Rights Council consider the violation of human rights, including serious violations such as arbitrary detention, torture and extrajudicial killing, their comments (and any consequent UN resolution) are usually focused on the State concerned rather than on individual representatives of that State (though senior politicians and military commanders are sometimes mentioned). This can – and usually does – have the effect of creating a sense of impunity on the part of State officials (especially those representing powerful States) – a sense that they can ‘hide’ behind the State and are, in effect untouchable. Third, in order for States to be bound by international human rights law, they must first voluntarily ratify the relevant UN human rights treaty or treaties. Notwithstanding jus cogens principles of international law (e.g. freedom from torture), the human rights obligations of States are usually understood to be limited (especially by States themselves) to those treaties to which they are Party. Finally, in the political organs of the UN human rights system, it is traditionally very difficult to prove that phenomena such as, for example, climate change or corruption, constitute a violation of human rights. That is because of the legal difficulties inherent in demonstrating causality – i.e. between an act or omission on the part of a State and a demonstrable harm to an individual’s rights. Indeed, it is usually US diplomats at the UN who take the hardest (and most legalistic) line on this point, arguing that there may be a relationship between, say, climate change and human rights, or even that climate change might undermine certain human rights, but drawing a clear line between this and any recognition that global warming violates the rights of those affected. The Global Magnitsky Act (GMA) represents a fundamental challenge to, and paradigm shift from, these key precepts of international human rights law and policy. First, it in effect extends US jurisdiction to address and respond to the violation of human rights anywhere in the world (i.e. it creates a system of universal jurisdiction). Second, it creates and explicitly recognises a causal link between grand corruption and serious human rights violations. Third, rather than targeting sanctions for serious human rights violations / grand corruption at States, the GMA directly and explicitly targets individual representatives of the State, specifically those individuals responsible for the alleged human rights violation. This has the potential to transform conceptions of international human rights law, justice and accountability. Finally, under the GMA it is irrelevant whether or not the State in which the violation is alleged to have taken place is Party – or not – to the relevant international human rights treaties. ‘Human rights abuse and corruption undermine the values that form an essential foundation of stable, secure, and functioning societies; have devastating impacts on individuals; weaken democratic institutions; degrade the rule of law; perpetuate violent conflicts; facilitate the activities of dangerous persons; and undermine economic markets. The United States seeks to impose tangible and significant consequences on those who commit serious human rights abuse or engage in corruption, as well as to protect the financial system of the United States from abuse by these same persons. The transfer or the facilitation of the transfer of the proceeds of corruption. Pursuant to Executive Order 13818, the President imposed sanctions on 13 serious human rights abusers and corrupt actors (named in annex to the Order), while the Treasury Department’s Office of Foreign Assets Control (OFAC), acting on behalf of the Secretary of the Treasury, in consultation with the Secretary of State and the Attorney General, imposed sanctions on an additional 39 affiliated individuals and entities. Individuals targeted include: Yahya Jammeh, the former President of The Gambia; Maung Maung Soe, Chief of the Burmese Army’s Western command, who oversaw the military operation in Burma’s Rakhine State that was responsible for widespread human rights abuses against Rohingya civilians; Sergey Kusiuk, commander of an elite Ukrainian police unit (the Berkut) accused of attacking peaceful protesters in 2013; Julio Antonio Juarez Ramirez, a Guatemalan Congressman accused of ordering an attack in which two journalists were killed and another injured; Ramzan Kadyrov, Head of the Chechen Republic; Roberto Jose Rivas Reyes, President of Nicaragua’s Supreme Electoral Council; Dan Gertler, an Israeli billionaire who has profited from corrupt mining deals in the DRC; Slobodan Tesic, an arms dealer in the Balkans; and Artem Chaika, the son of Russia’s Prosecutor General. It is clear from the foregoing, that the GMA represents a completely new and innovative instrument to secure individual accountability for human rights violations or corrupt acts. The fact that it is the US, with its financial and political reach, that is imposing such sanctions will have a clear deterrent effect on government officials around the world, and neatly turns the tables on perpetrators of human rights abuses by empowering their victims (who can now provide information on the violations to the US authorities). The GMA is, in other words, a human rights protection instrument with real teeth. Perhaps that is why other Western States are following America’s lead. In 2017, the UK passed its own Magnitsky law, the Criminal Finances Act, which allows authorities to recover proceeds of gross human rights abuses overseas that are housed in the UK. Likewise, in 2017 the Canadian Parliament passed the Justice for Victims of Corrupt Foreign Officials Act (Sergei Magnitsky Law). Talk of an EU-wide Magnitsky Act raises another intriguing possibility: what if all the world’s major economic powers, nearly all of which are politically committed to protecting against human rights abuses and corruption at home, came together to negotiate, adopt and eventually ratify a universal Magnitsky Act? It is difficult to imagine a more powerful international mechanism for preventing and protecting against human rights abuses and grand corruption, or for spreading the net of global accountability and justice. Witchel, Elisabeth. “The Magnitsky Act: An alternative form of justice, but not a replacement for it.” IFEX, 21 Dec. 2017. Web. Available at: https://www.ifex.org/international/2017/12/21/magnitsky-act/. Klehm, Bryce. “The Magnitsky Act: Legislative Justice.” Penn Undergraduate L. J., The Roundtable (2018). Web. Available at: https://www.pulj.org/the-roundtable/the-magnitsky-act-legislative-justice. 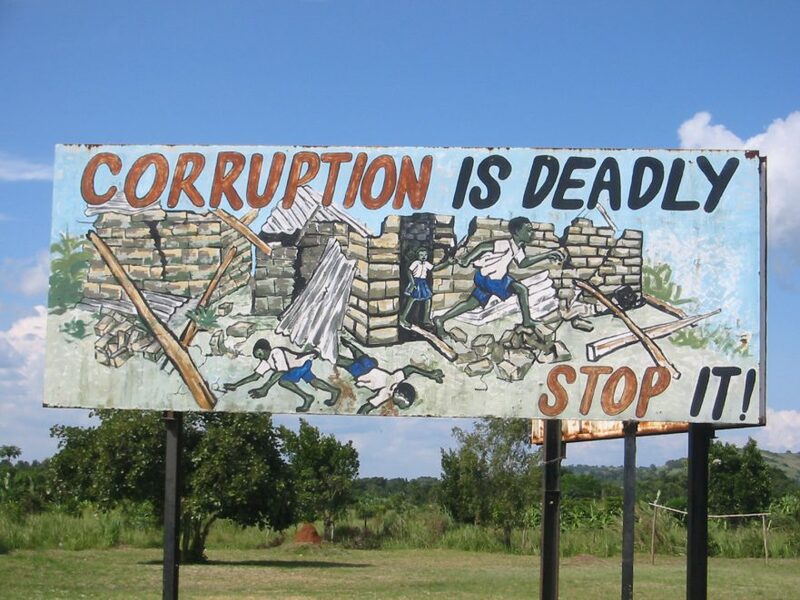 Feature photo: Ugandan anti-corruption sign, ‘Corruption greatly undermines government effectiveness,’ licensed under CC By 2.0. How to operationalize the Council’s prevention mandate, and where does it fit within the Secretary-General’s UN ‘prevention agenda’?